Atlas (2017). Eleven Spaces, Numeroventi. Florence, Italy. 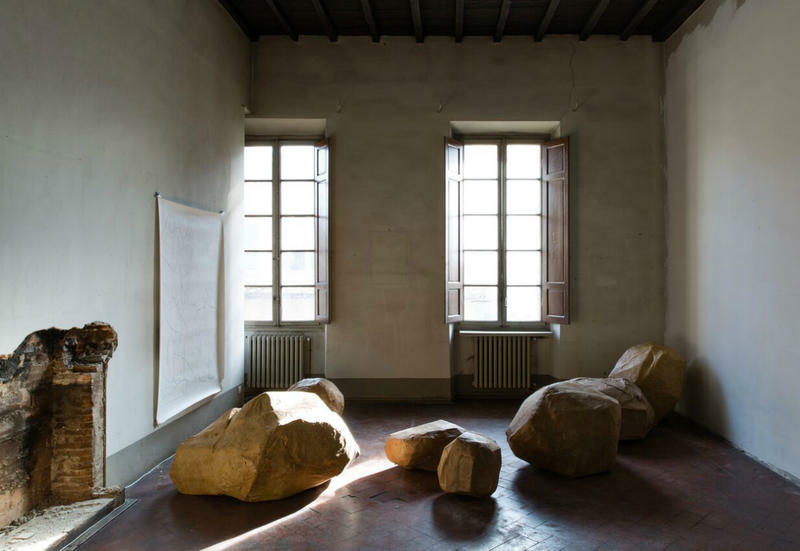 Atlas invites the viewer to engage in shaping the space, shifting and stacking the boulders as they topple to the floor. Just as the space they inhabit, the materials of construction are revealed by the wearing down of the surfaces and their repeated manipulation through time. Each gesture contributes to the erosion of the space and the objects, yet the playful interaction is one of continuous construction, suggesting the possibility for using this state of flux as an invitation to build rather than to demolish. The figure reappears here in the spaces of Numeroventi at times seemingly at home, and at others like a fleeting apparition. Inspired both by the striking minimal lines of the artist apartments as well as the historical details of the palazzo, these photographs capture the figure as it shifts between time periods, seeking solid footing as it goes.